If the interview is the meat, and narration the potatoes, the B roll brings in the cilantro and smoked peppercorns. Ambient background, or as our author, Willow Yamauchi likes to call it, "wild sound," is what makes a radio production feel genuine and visceral. 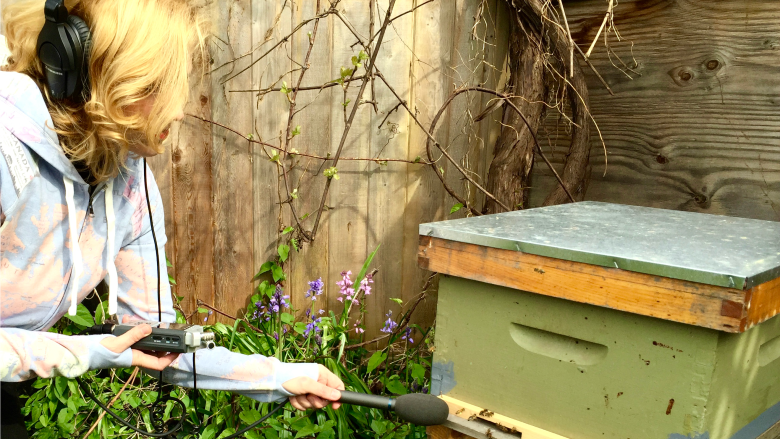 Willow Yamauchi braving the bees in the backyard of her Vancouver home in search of a perfect “buzz." Every journey into audio storytelling requires a compelling story and great narration. But what about the ambient sound, the so-called "B roll"? If the interview is the meat, and narration the potatoes, the B roll brings in the cilantro and smoked peppercorns. Ambient background, or what I like to call "wild sound," is what makes a radio production feel genuine and visceral. 1. Don't talk or laugh, even if it's really funny, just laugh inside. There's nothing worse than your own chuckle mucking up a piece of great tape. Just zip it and smile and nod vigorously. 2. Don't be shy! Get up and cosy, really cosy. Get that mic as close as you can while watching your levels — unless you have a shotgun mic, in which case you can practice more decorum. 3. Don't leave without extra batteries.Always, always carry batteries. Is this clear? You never know where you are going to find sound and you must be prepared. 4. Don't just record the ambient sound. It's also crucial to write down everything you see, or snap photos to aid your memory. Your narration will round out and embellish the sound, but you might not remember why you wanted it in the first place. 5. Don't fudge it! It either happened and you captured it, or it didn't. I'm not pretending to know everything about radio — I'm still new at making docs. I'm a learner. And at first, I gave wild sound no thought at all. In fact, I actively avoided it. I thought it was a nuisance, a distraction, something to be avoided. In my quest for perfect, clean tape I edited out any strange interruptions, like barking or a phone call. I'd even wait until my guest was sitting down and comfortable before turning on the recorder. 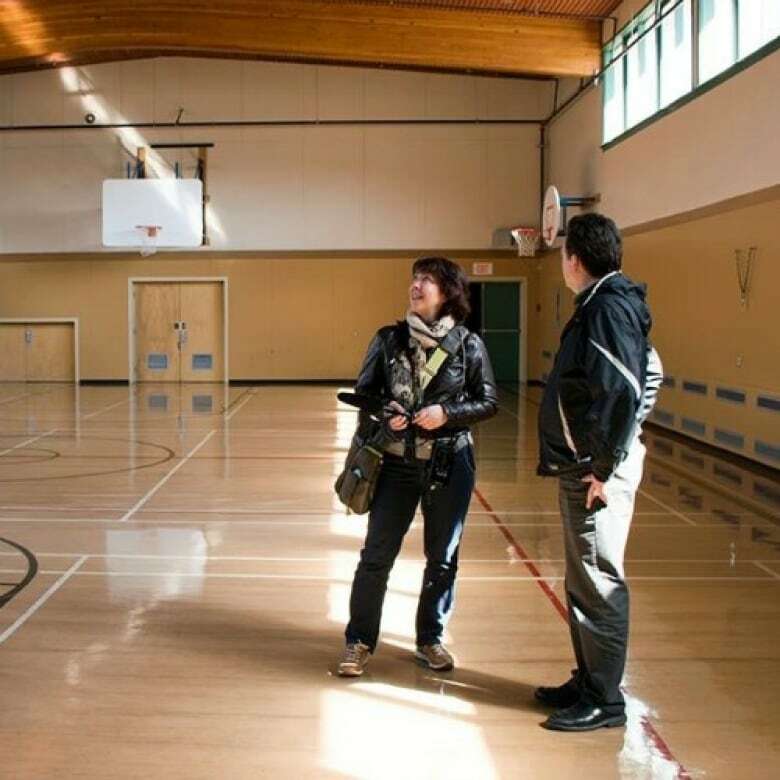 Rebecca Hass and Rob Gloor in the gym of St. Joseph's Catholic for the documentary The Gift that aired on The Sunday Edition. (Rob Severin)But listening back to those interviews, they seem a little flat. They start and end in a sanitized manner. Everything seems well-controlled, with no off-the-cuff interactions. They are sound bites, not conversations. Luckily, I had an intervention. A few very experienced producers, including my Doc Project mentor Joan Webber, introduced me to the importance of gathering background audio. Wild sound is important because it proves to the listener that the story takes place in the real world. The honking of a horn, or the turn of a lock in a door can be more vivid than a beautifully crafted paragraph of narration, and takes no time for the listener to process. How does one procure this magical element? Think of gathering wild sound as a kind of harvesting. Like foraging for wild foods, you cannot control what you are going to find. You have to have open ears and an open mind. And while you can't manufacture wild sound, you can learn to recognize and sample sounds that will be useful to establishing the context and atmosphere of your story. 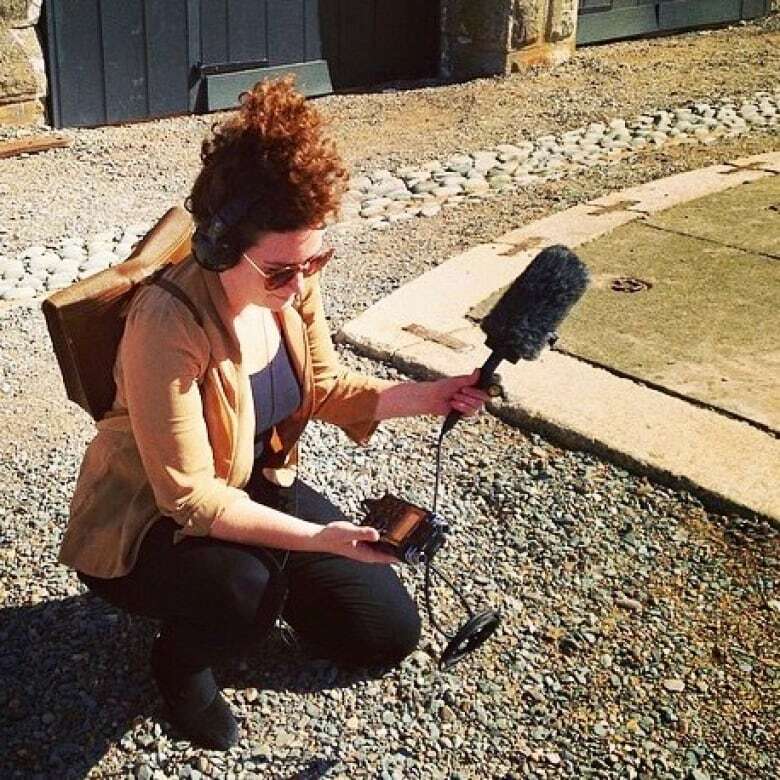 Veronica Simmonds testing out some gear and ambient sounds for an episode of her show, Braidio. For example, always grab two minutes of "room sound" at the end of an interview to help with mixing. Greetings and goodbyes are also always a keeper, as you never know what's going to happen once everyone forgets to behave like they are in an interview. Beyond these standard sounds, be creative. Stand outside a home before entering and just tape the outdoors for a minute or two. Pay attention to anything that catches your interest. Is there a little creek burbling? Are there some chickens checking you out from the other side of a fence? Is there an active game of street hockey down the lane? That sound is yours for the gathering. 1. Do hit the door rolling your tape. This is kind of awkward the first couple of times, but you only get a chance to record a first impression once! Those footsteps, door knocking and "hellos" are perfect scene setters. 2. Do wear your headphones! You might assume you are gathering what you hear, but you know what they say about assuming ... monitor your levels and make sure you are capturing the sound the think you are capturing. 3. Do use the right microphone (if you have the option). The shotgun mic is the mic of choice for most ambient sound and sound captured from any distance. If it's windy, you want to use a "dead cat" (not a real one). 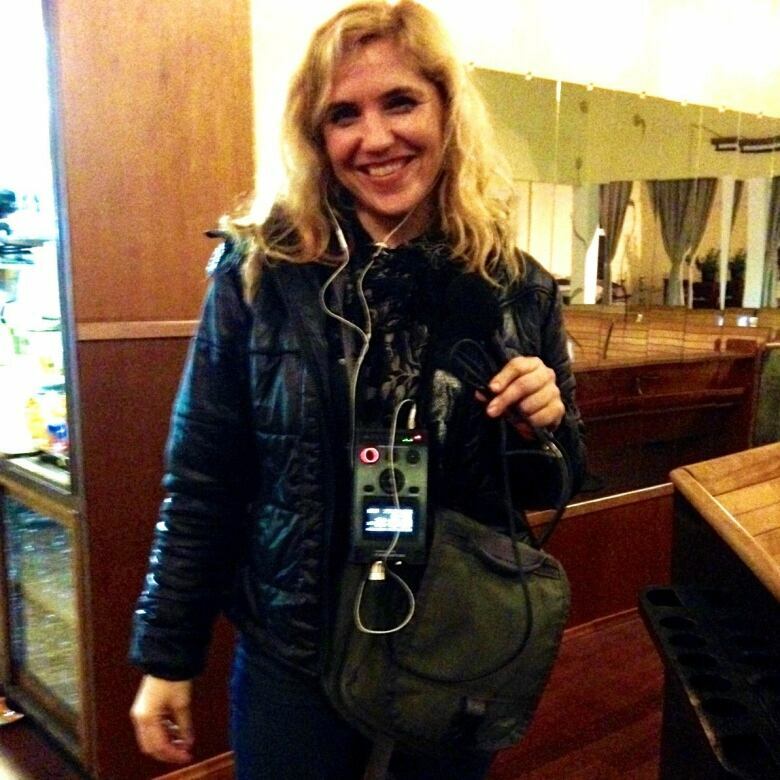 That said, in a pinch, don't be scared to capture sound on any mic, including your smart phone. 4. Do interview dogs, chickens, or bees. Animal sounds are terrific, and amazing scene setters. Watch out for birds overhead, they sound great. 5. Do close your eyes and listen. What do you hear? There may be some odd sound in the soundscape you can use at a later time. Are there children playing a game of skip rope? Is someone tapping on a computer? Are cars honking? Capture that sound, it's gold. Gathering them is not necessarily an instinctive process, at least for me. The first time I walked up to a door with the tape rolling, I felt like a jerk. It seems like bad manners to record people before explicitly asking for their permission. The first time I gathered tape of kids laughing on the swings, I felt more than a little weird. The first time I stuck my mic in the face of a barking dog, I felt stupid and vulnerable — but you know what, I used all that tape and it sounded great! Something else to keep in mind is that wild sound is kind of an implicit promise of authenticity. There are meaningful debates in the industry about whether it is ever acceptable to "fudge" your backgrounds. For example, if your interview is about a certain type of bird, you'll obviously want a recording of its noises. If for some reason you couldn't get the tape, or the tape got ruined, you have a problem. It's very, very tempting to be expedient. Why not just plug in a generic bird call, who's gonna know? After all, what are sound effects but manufactured illusions? Willow Yamauchi on location in an old church in Port Alberni, B.C. In my opinion, we should not go there. Maybe there isn't a hard and fast rule about this, but every producer I've worked with has been clear that faking is not OK. The sound was either recorded as and when you say it happened, or it didn't, and you move along. You can help prevent this problem by being methodical. Bring notes regarding sounds you anticipate wanting to your interview to make sure you remember to get it. Alternatively, you might be able to find archival tape with the correct sound that you can use for illustration, as long as you note this and credit the source. And in the end, if you still fail to get that all important sound, you can use that as a narration point about how your quest to capture this one sound failed – that's actually really a human, interesting moment that can become part of the story! Willow Yamauchi is a storyteller from Vancouver, B.C. Her audio pieces have appeared on a number of CBC Radio shows including: The Current, Ideas, DNTO and North by Northwest. She is the author of Adult Child of Hippies and Bad Mommy.